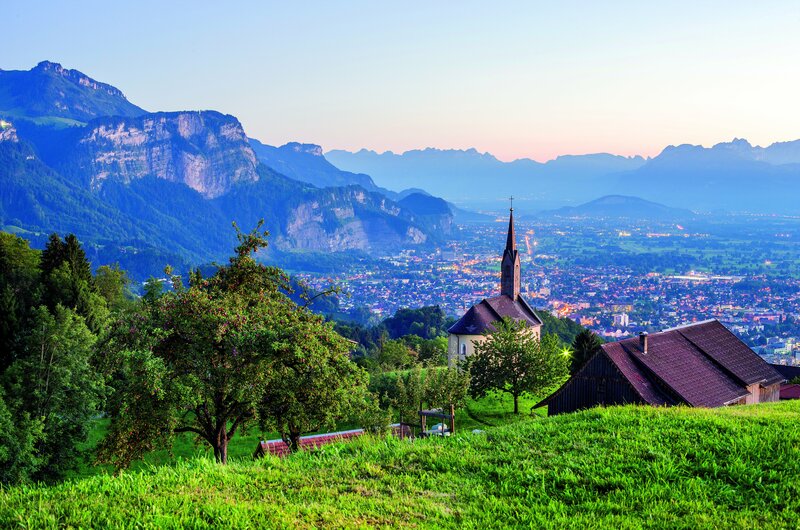 Vorarlberg is located in Austria‘s very west, neighboring Germany, Switzerland and the Principality of Liechtenstein. This highly dynamic region is famed for its innovative architecture and rich cultural life. Residents and visitors alike appreciate its scenic splendor, excellent quality of life and top-of-the-range hospitality. Vorarlberg prides itself on abundance of natural beauty stretching between Lake Constance and the over 3,000 m-high mountains. From north to south it extends 100 kilometers. In one-and-a-half hours you can drive from the shores of Lake Constance (400 m altitude) to the high alpine regions of the Silvretta and be surrounded by glaciers. Festivals big and small abound with programs featuring a wide range of theatre, dance and music performances, from classic to pop. With its splendid opera productions on the world’s largest floating stage, the annual Bregenz Festival (in July/August) marks the climax of the cultural year. Economically, Vorarlberg is among Austria’s top performers. At around 60 percent, its export share is the highest among all of Austria’s provinces. The biggest and best known companies headquartered in Vorarlberg are Doppelmayr Lifte, world market leaders in ropeway technology, Blum GmbH (fittings), Alpla (plastic packaging), Zumtobel (light design), Wolford (body wear), and the fruit juice manufacturers Rauch and Pfanner. As Vorarlberg has set itself the goal of becoming energy-autonomous by 2050, energy efficiency and sparing use of resources take top priority. Numerous projects promote e-mobility. When it comes to generating power, Vorarlberg has long been privileging hydro-electricity. Nowadays Vorarlberg is considered to be a pulsating heartbeat of European architecture. The little land is full of surprises from numerous unusual art projects. What is novel is the incomparable blending of old and new architecture. In fact, contemporary architecture is what makes it crystal clear just how boldly Vorarlberg marches towards its own future, and how important audacious architecture is to its people. Both a profound attachment to tradition as well as a readiness to reach out to startlingly new trends beckoning from the future emanate from these buildings. Cooperation with handicrafts is intense. Wood remains the preferred raw material. Typical local inns or fancy restaurants, Vorarlberg has it all – at consistently high standards of quality and excellent value for money. The recipe for success subscribed to by Vorarlberg’s chefs is a long-standing close collaboration with local producers. Cheese is surely the most popular specialty of Vorarlberg, particularly the spicy Bergkäse, a hard mountain cheese. It is made by hand on many small dairy farms, often in summer on alpine farmsteads. Some of Vorarlberg’s distilleries are among the best in Austria. The typical Vorarlberg fine brandy is the exquisite Subirer which is distilled from a plain must pear. Vorarlberg’s towns and villages harmoniously blend tradition and modernity. The capital of Vorarlberg is Bregenz (28,000 inhabitants), although Dornbirn (47,000 inhabitants) and Feldkirch (31,000 inhabitants) have larger populations. Vorarlberg is also distinct in that it is the only state in Austria where the local dialect is not Austro-Bavarian, but rather an Alemannic dialect; it therefore has much more in common culturally with its Alemannic-speaking neighbours Switzerland, Liechtenstein and Swabia than with Bavaria and the rest of Austria.